A Degree in Cybersecurity or a Certification Course: Which is Better for Your Future? The demand for cybersecurity professionals continues to grow as the top five in-demand IT jobs in 2017 were in the domain of security. This increase in demand is the result of the immense amount of breaches over the past twelve years (over 10 billion records breached in the U.S. since 2005). As IT professionals flock to the alluring field of cybersecurity, they look for various ways to develop their knowledge and skills to bridge the widening gap in the job market. While some prefer chasing down various certifications others prefer a single title to their name. One of the most debated questions in the market is “which is better for my future – a bachelor’s degree or a certification course?” Asking this question is much like filling a glass of water halfway and then asking if it is half-full or half-empty – there is no right answer. However, there are many factors that can influence a decision like this, such as time, career goals, and investment. According to a report by McAfee, obtaining a Bachelor’s degree is the minimum qualification for entry-level positions in cybersecurity. That’s not to say there aren’t many cybersecurity professionals who have not obtained a degree and still done very well in the industry. 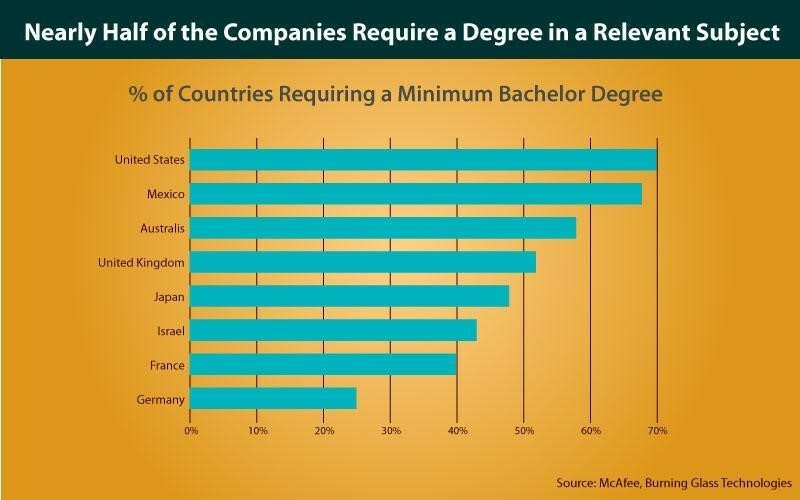 While this might be the case in the past, the need for a degree in the relevant subject is on the rise, with nearly half of companies making it a minimum requirement. A degree demonstrates a candidate’s dedication, discipline, and hard work. It also shows that the degree-holder has vast amounts of knowledge on the subject, as gaining a degree in fields like cybersecurity, mathematics, or computer science is not an easy task. Most degrees in cybersecurity cover technical aspects of the subject such as the security of various operational systems, network security, and cloud security, while also covering other aspects such as legal and ethical issues, policies and plans, current trends, and many more. 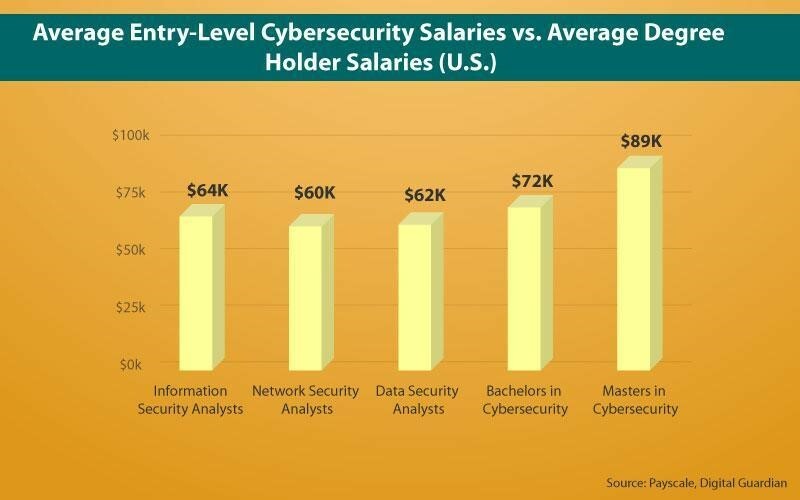 According to PayScale (a U.S. online salary, benefits, and compensation information company), the average entry-level salary for many cybersecurity professional jobs does not exceed $65K whereas a study by Digital Guardian reveals that the average starting salary for a cybersecurity graduate is close to $73K and a cybersecurity master’s degree holder is close to $90K*. A degree also provides the perfect footing for those aspiring to be in a managerial position such as Information Security Manager or eventually, Chief Information Security Officer (CISO). A cybersecurity career could include job titles like Information Security Analyst, Penetration Tester, and Security Architect. Quite often, it can be confusing to understand what your career path should be and which sub-speciality might be the best fit for you. Pursuing a degree not only gives you enough time to learn about all facets of information security, but also allows you to figure out what you’re interested in and what you’re best at. Most corporations hiring information security professionals require that the candidate have a bachelor’s degree in computer science, cybersecurity, or a related field. In fact, many companies are now insisting that candidates applying for advanced positions— Chief Information Security Officer or Security Director— obtain a master’s degree in cybersecurity. While a cybersecurity certification will help you develop and hone your skills and knowledge in a specific field, degrees can help carve the path up the corporate ladder. Of course, there are now executive-level certifications that are relevant to the executive career path as well. Nearly all certifications come with a lifespan of two to three years, following which the certification must be renewed via continuing education, a renewal fee, or some other process. However, a degree doesn’t have to be renewed as the knowledge gained through a degree program is seen as having a much longer lifespan. Degree programs tend to teach students how to think and work through problems and that kind of knowledge doesn’t expire. Cybersecurity is an evolving industry and staying abreast of the latest trends, threats, and changes is critical. Hence, obtaining both a degree and a good mix of certifications is ideal for today’s era. EC-Council University plays a pivotal role in assisting individuals achieve both – ECCU degrees allow students to take many of EC-Council’s certification exams so that individuals graduate not only with a degree, but with a string of certifications earned simultaneously. *The salaries mentioned are taken from various sources (mentioned below). Salaries and employment status may differ from country to country and state to state. Individual research is encouraged.